February 1 marked World Read Aloud Day. I was fortunate enough to be able to celebrate by sharing my books with 75 fourth and fifth grade students at Bancroft Elementary School in Wilmington. Through the generosity of United Way of Delaware, I was among several authors who traveled to schools across Delaware to share the love of reading. In addition, United Way purchased nearly 40 copies each of my books The Sound in the Basement and Beach Fun: Poems of Surf and Sand. This meant that every student received a signed book to take home. For decades, research has indicated the importance of reading aloud with children. We often think that such reading should stop when kids are old enough to read on their own. Teachers know better. Students can understand stories that are far beyond their capability to read on their own. Reading aloud to elementary—or even older students—allows teachers to introduce higher-level concepts and vocabulary. One of my fondest memories of elementary school is my third-grade teacher reading aloud to us each day from a biography of Wild Bill Hickok. I don’t remember much about the book. In fact, I don’t think it was even a particularly good book. But I do know that I looked forward to hearing her read aloud to us at the end of each school day. That’s the beauty of reading aloud to children. It’s our enthusiasm about a book and our joy in reading that matter even more than the titles we choose. So let’s celebrate World Read Aloud Day all year long by sharing our love of reading with children. In a world that far too often revolves around electronic stimulus, the sharing of a real printed book with children is a greater gift than ever before. As a writer, I had a lot to celebrate in 2018. I passed the milestone of selling my 50th book around mid-year. Now I’m up to 52 and counting. My picture book, One Leaf, Two Leaves, Count with Me was included as both a Dolly Parton Imagination Library and Scholastic Book Fair selection. I got to research and write new books about some really interesting topics, such as Ruth Bader Ginsburg, Tecumseh, Abraham Lincoln, Geronimo, and more. In addition, I continued to do interesting writing and editing work for the Global Reading Network, an initiative funded by USAID to support early grade reading in low- and middle-income countries. In many ways, that work is reminiscent of the work I did for so many years for the International Literacy Association, and I continue to enjoy it. As rewarding as 2018 was professionally, I am hoping for an even better year in 2019. What’s next? I don’t really know yet. Regular clients, such as Capstone and Cavendish Square, always seem to approach me with interesting topics to explore. New clients often crop up at unexpected times with projects I hadn’t previously considered. Furthermore, I am working on several interesting books on my own. They aren’t far enough along to discuss yet, but I hope to have news to share as the year goes on. Many of the books I write are commissioned—publishers ask me to write a book on a particular topic, often as part of a series they are developing. I enjoy such projects for two major reasons: 1) I get to research interesting subjects I might not otherwise have thought to explore; and 2) I know if I execute the book well, I have a guaranteed sale. That’s important when you are a freelancer. The projects I pursue on my own have different appeals and challenges. The main appeal is that I get to choose any subject that interests me and develop it in whatever manner I wish. The main challenge is that I have to convince my agent that it’s a salable book, and she has to then convince a publisher. The risk is that I may invest a lot of time, effort, and passion on a project that may never get published. That does happen, and it hurts. But when it works out, as it did with One Leaf, Two Leaf, Count with Me, it’s truly exciting. Each year, I work to find the appropriate mix of projects. I also have several school visits lined up for the winter and spring. It’s really fun talking with students about writing and getting them excited about working on their own writing projects. I always look forward to the days I spend in schools. In short, 2019 is already shaping to be a busy and productive year. And, if recent history is any indication, there are other exciting projects coming down the road that I haven’t even considered yet. I look forward to seeing what lies ahead. One of my goals for 2019 is to be more regular about doing blog articles, and I will keep you posted on my progress on various projects. 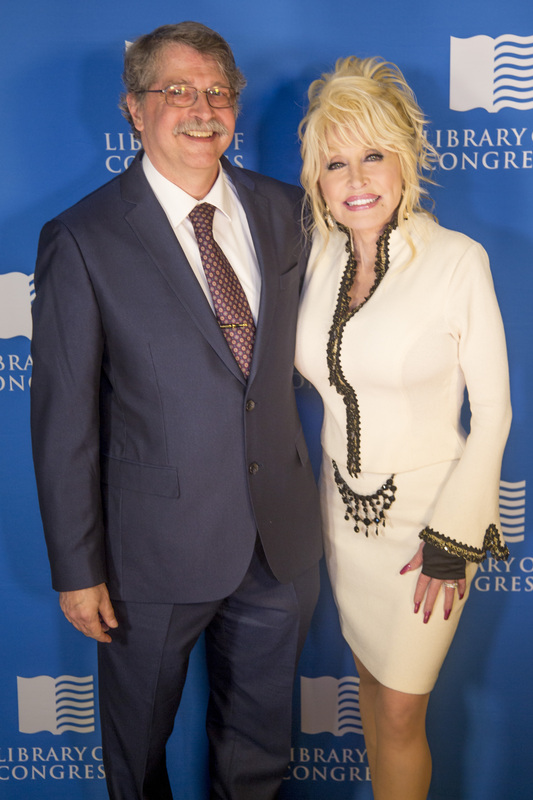 With Dolly Parton at the Library of Congress in February 2018 celebrating the distribution of the 100 millionth book through the Imagination Library. When I wrote my first children’s book in 1988—a biography of Leonard Nimoy from Star Trek—I set a personal goal of publishing 50 books before I retired. It worked out to about a book and a half a year, which at the time seemed possible, even writing in my spare time. But then I went a dozen years until my next book, Daddy Poems, came out from Boyds Mills Press. At that point, the goal seemed unlikely. I continued to do books as the opportunity presented itself, but with a busy full-time job and two young children, I couldn’t do more than one or two a year. By the time I left the International Literacy Association in 2011 to pursue writing full-time, my total stood at 16 books. Then things started to snowball. At the ILA Annual Conference in 2013, I introduced myself to Christine Peterson, assistant editorial director at Capstone, and asked if they needed writers. From that came an offer to write a book about the Lewis & Clark expedition. And from that came the opportunity over the next several years to do about 20 more Capstone books on a wide range of subjects ranging from history to social studies to biographies. In recent years, I’ve been able to write nonfiction books for National Geographic Kids and Cavendish Square as well. 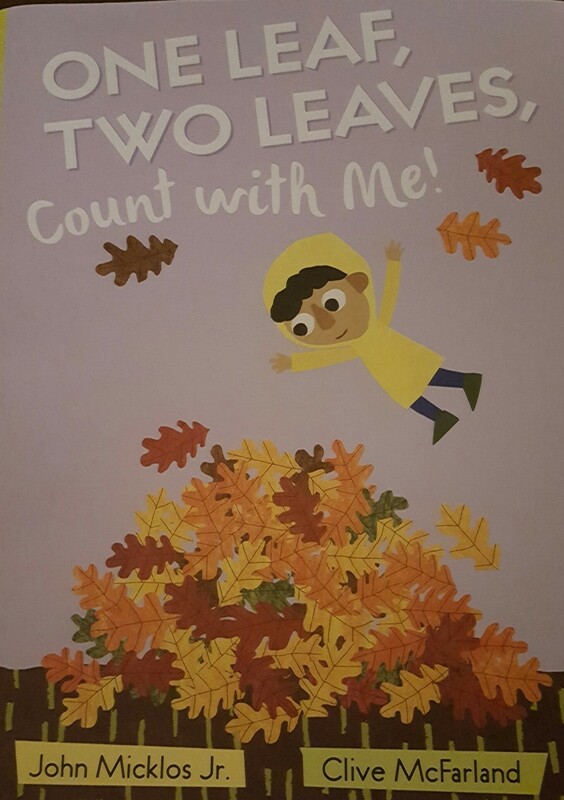 In fall 2017, my picture book One Leaf, Two Leaves, Count with Me came out with Penguin. This was my first book with one of the “Big Five” publishers, and I’m delighted with how it turned out. The illustrations by Clive McFarland of Ireland are wonderful, and the book has drawn many positive reviews. It also got selected for the Scholastic Book Club. In addition, the book was chosen for inclusion in the 2018 Imagination Library—Dolly Parton’s book program—and sometime this fall it will be mailed to tens of thousands of young readers across the United States and Canada. This summer, I signed on to do four books for a publisher named Hameray from California. As I finished the manuscript for the first one—a picture book about Abraham Lincoln—I realized that when this book comes out in 2019, it will be my 50th! This realization brought a great deal of satisfaction and pride, along with a bit of anxiety about what my NEXT goal should be. I feel like I’ve still got a number of productive years ahead. So what’s next? I’ll keep you posted as soon as I know. I’ve been meaning to write a blog article for weeks, but I’ve been so caught up bouncing from one activity to the next that I just haven’t had the chance. In addition to my regular editorial consulting work, which occupies at least half of my time, what else has kept me so busy? Lots of activities—all of them fun. Here’s a quick overview. Pages Party at Newark Library: On February 24, I spoke to dozens of young writers whose writing or artwork was selected for inclusion in this year’s Pages publication. The event, which was sponsored by New Castle County Libraries, drew a packed room as families joined the celebration. It was truly inspiring to be among so many talented young people! SCBWI Regional Conference: On March 17-18, I spoke at the SCBWI regional conference in Maryland. I conducted a workshop on writing and selling nonfiction, and I participated in a panel discussion on getting and working with an agent. In addition, I held individual critique sessions with three writers. Being surrounded by the enthusiasm of fellow writers for a weekend always energizes my work for weeks after. Mini Book Tour in New York: I organized a mini book tour in New York for March 24-25. On Saturday, I did a reading and book signing at the delightful McNally Jackson bookshop in Manhattan (where my cousin’s daughter, best-selling author Kate Milford, works). A small but enthusiastic audience listened to stories and asked questions about writing for nearly an hour. The following day, I read and signed books at the Dolphin Bookshop in Port Washington. All in all, the weekend proved quite an adventure! Delaware Writers Studio: On April 15, I spoke about “Writing for Children” to aspiring writers at the Kirkwood Library. Attendees seemed to really enjoy the suggestions I was able to offer on writing and selling books and articles to children’s publications. I’ve reached the stage in my career where I find it gratifying to share the knowledge I’ve gained over the years with others who just beginning their journeys as writers. Book Writing: Sandwiched in between all these other activities (and my consulting work), I was able to make progress on several book projects. I finished editing/proofing Capstone books on Kids’ Legal Rights and Decoding Propaganda, and I signed contracts for five new books. In the coming months, I will be writing biographies of Ruth Brader Ginsburg and Tecumseh, as well as a You Choose adventure book, all for Capstone. I also will be doing updates of books about the states of Pennsylvania and Illinois for Cavendish. In addition, I’m working on two picture book manuscripts. I don’t want to say too much about those for fear of jinxing them, but I’m excited about both. One is a collaboration, and the other is a potential follow-up for One Leaf, Two Leaves, Count with Me! Freelancers always say that it’s better to be too busy than not busy enough, and I have definitely been in the “really busy” category for the first four months of 2018. Given the projects already booked for the summer and fall, I foresee busy times ahead. I feel truly blessed to be able to work on projects that bring me so much satisfaction and joy. It’s hard to believe how fast 2017 sped by! It was certainly a productive year for writing, capped by the release of my picture book One Leaf, Two Leaves, Count with Me by Nancy Paulsen Books/Penguin in September. The book turned out wonderfully! Clive McFarland’s illustrations are gorgeous, and the book earned great reviews from School Library Journal, Publishers Weekly, and Kirkus Reviews. It has not yet become the bestseller I had hoped, but I plan to do another big publicity push for spring, as the book’s descriptions of leaves growing on the tree in the spring and dropping in the fall make it appropriate for both seasons. I also wrote several other books in 2017. I did books on the First Amendment, Fourth Amendment, Children’s Legal Rights, and Decoding Propaganda for Capstone, and I wrote books on Teens in Prison and the State of Wisconsin for Cavendish Square. All are slated for release in 2018/2019. I have other projects in development as well, but they are not very far along yet, and I don’t want to jinx them by talking about any of them in detail. When I left the International Literacy Association in 2011 to pursue life as an author, I set a goal of publishing 50 books before I retired. At the time, I had 15 books to my credit, and 50 seemed a long way off. I often wondered if I was being unrealistic. Entering 2018, I have 44 books either in print or in process, and it seems likely that I may reach 50 books well before I turn 65. I guess I’ll need to set some new goals! I enjoy the process of writing books (most of the time), but even more rewarding are the related activities: visiting schools, libraries, and day care centers; speaking at conferences for educators, librarians, and other writers; and doing signings at bookstores. In November, I visited Rupert Elementary School in Pottstown, Pennsylvania, where I grew up. It was especially meaningful to me to share my writing and my experiences as a writer with youngsters from my hometown. I hope it inspired them to follow their dreams, just as I did. For 2018, I look forward to several school visits that are already scheduled for the winter and spring, as well as speaking at the SCBWI regional conference in Maryland in March. I’m sure other opportunities will arise, and I look forward to those as well. Like most children’s book writers, I supplement my author income with other writing work. I continue to do editing and writing work for the Global Reading Network and Read to Them. I feel fortunate to be able to support literacy-related efforts and continue the interests I developed during my many years working for ILA. Counting Down to a Counting Book! With that line as an inspiration, I rushed back to my cabin and pulled out my laptop. By the end of the day, I had roughed out a manuscript telling the story of leaves growing on the tree from 1 to 10 in the spring, dropping from 10 to 1 in the fall, and then growing again the following spring. After getting feedback from my fellow writers at the Highlights Unworkshop and colleagues in the northern Delaware SCBWI critique group, I sent the manuscript to my agent, Erin Murphy. She loved it and submitted it to Nancy Paulsen, President and Publisher of the prestigious Nancy Paulsen Books imprint of Penguin Young Readers Group. Nancy accepted it in just eight days and then enlisted the talented Clive McFarland of Ireland to bring the words to life with his illustrations. Now the countdown is on for One Leaf, Two Leaves, Count with Me! The finished book will be released on September 5, just in time for the fall foliage season. Of all my 35 books, I think I may be most excited about this one! I will have further updates on the book as publication grows closer. Here’s the cover.